“The atheists seem very competitive. For them, it’s all about the competition,” James reasoned, but whether or not the Atheist passersby were genuinely good-hearted, just wanted to stick it to religion, or somewhere in between is unknown. Not exactly the most scientific poll, but the marketing technique might just catch on. 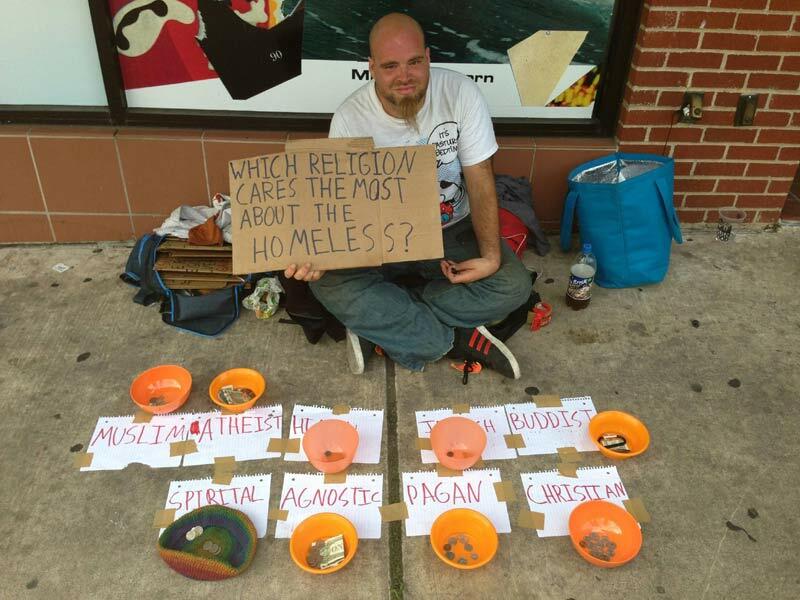 Thanks to: Atheists Winning Homeless Man’s Giving Contest. I saw this young Muslim women on the TV news last night. She was demonstrating against the US over that silly video. The interview asked her _”but don’t you believe in freedom of expression. My response – grow up! A YouTube video mocking followers of science and those who discount the probability of omnipotent deity, has resulted in complete indifference throughout the Atheist community. Theist comments on the video claim that the video will see “atheists burning down churches the world over!” have been met with blank stares by people who consider themselves ‘atheist’. The maker of the video has gone into hiding claiming that Atheist disinterest in his film has infringed his religious freedoms. Book Review: The Australian Book of Atheism Edited by Warren Bonett. Publisher: Scribe Publications (November 2010). This is a book by Aussies, for Aussies. But given our similar histories and cultures there is a lot here for Kiwis as well. As is the nature of such collections most readers will find something of interest. And different readers will inevitably have different favourites. My review reflects my own interests. It seems that some of the delusional god-bothers in the US are upset because there President omitted their god in the list of people he expressed gratitude to in his thanksgiving day speech. As PZ Myers put it – you would think that Obama was joining the New Atheists! What a pack of whiners! I have always thought it rude not to express one’s gratitude to those who deserve it. And there are plenty (see Thanks, Thanking those who deserve thanks and Appropriate thanks). What’s with this rude habit of thanking a mythical being for one’s meal and ignoring the cook, serving staff, farmers, etc. Hell, I would even be thanking the agricultural scientists for their contribution to my meal. Yet astronomer Neil deGrasse Tyson relates what could be a common experience. At a thanksgiving meal he attended everyone went around the table expressing their thanks. Until he spoke they were all thanking their god. He expressed his gratitude to agriculture – far more sensible and genuine. But he got booed! Sam Singleton presented quite a relevant atheist sermon on gratitude and religious hypocrisy at the recent US Skepticon conference. Have a look at the video below. Here’s a great video. It’s not short (31 mins) but its well worth watching right through – or downloading and watching later. Even watching several times, the speaker is so eloquent and precise with his language. In it Scott Clifton gives a thorough critique of the Christian apologetics understanding of morality. He also gives a good outline of secular morality – a rational, objectively-based morality. Treatise on Morality. – YouTube. What do we specifically mean by words like “right,” “wrong,” “moral,” “immoral,” etc.? Why our definitions are useful and applicable and why they represent how the vast majority of people see these words, whether they realise it or not? How can we objectively determine what is “right” and what is “wrong” without appealing to personal taste or subjective opinion? Why we ought to do right and ought not to do wrong? He answers the first question by defining “right” as that which promotes the health, happiness and well-being of humans. Or minimises unnecessary human pain or suffering. And “wrong” of course is the converse. Immediately I know many readers will reject his definitions. But if you do, you should hear him out. Watch the video. Listen to his arguments. I suspect you might find that you do in the end agree. I do.